Our last day in the Canadian Rockies. It meant retracing our route back down the Icefields Parkway to Banff for our final night. Just one week since we journeyed north, but already there was change. The timing of this trip was no accident. It had to fit between Erik’s graduation and starting his new job. But it also coincided with our philosophy of traveling in the shoulder or off-season. There are a few drawbacks to be sure, but the advantages suit our style. It means avoiding crowds and having places to ourselves. It’s simpler, less stressful and more economical. The main barrier on this trip was the reduced access to hiking trails. Many were still closed due to snow, and more than once we had to change plans on the fly when faced with weather conditions. Today was a prime example. On reaching our chosen trail head, not only could we see that the hike started in the snow, but hikers preparing to leave were outfitted with gear and clothing we clearly did not have. Good sign that we should seek a different trail at a lower elevation. But fortunately, the area is filled with alternate options. We were not able to summit peaks or access some passes. Wildflowers were only just beginning to bloom, temperatures were chilly to cold at times, and some areas had yet to green up. But early spring conditions have their own appeal. On the flip side, we rarely shared trails with anyone. Major sites had only a handful of visitors. Restaurants greeted us eagerly and offered prime tables with views. Innkeepers were still fresh with the season opening and offered lower rates. And the volume of RVs and tour buses on the roads was easily tolerable. Our return route gave us a taste of high season. We traveled on a Saturday, and visitors abounded in each turnout and viewpoint. Reaching Johnston Canyons which we visited practically by ourselves the previous Saturday (granted it was the day that snowed), we were astounded to see cars, trucks and RVs spilling out of the ample parking lots onto both sides of the road! If we weren’t convinced of our early season strategy by then, that sealed it. We also found previously ice bound lakes to be opening up. And wildlife was in great evidence. 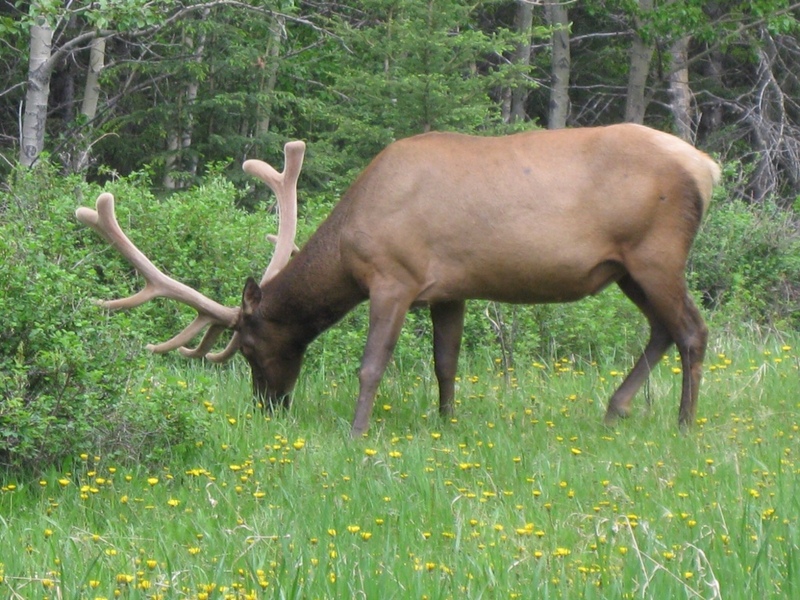 We got our first close up look at elk with huge racks, at two different spots along the road. Banff was teaming with activity when we arrived. 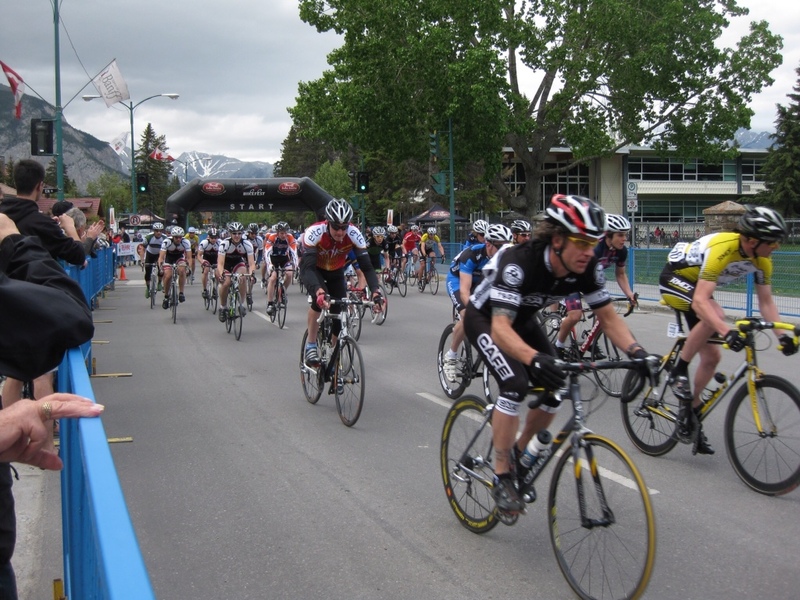 The source was the annual Banff National Park Bike Fest, and that day they were holding criterium races, on a 1 km loop around the main streets of town. We’d never seen such events before, and with the help of a local who explained the rules to us, we joined the spectators lining the route and enjoyed the excitement of the races. It was a fun and unexpected way to end our trip. We’re sticking with our strategy. We picked the right week. 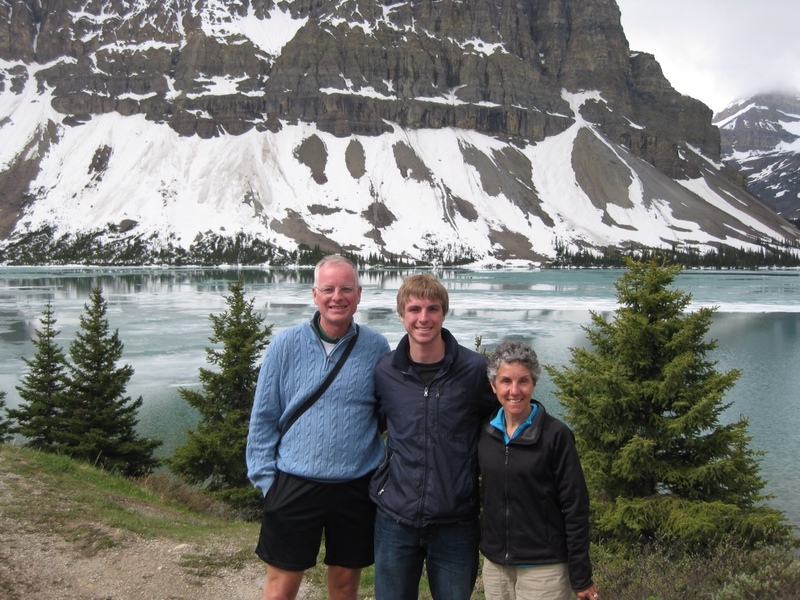 This entry was posted in Outdoors, Travel and tagged Banff Alberta, Canadian Rockies, Cycling, Hiking, Outdoors, Travel by Molly. Bookmark the permalink.